The success of any crowdfunding project comes down to two primary factors: The product & the marketing. Taking these two factors, and putting them on a spectrum from good to bad, gives us the Crowdfunding Success Matrix. This matrix allows you to identify the position of any crowdfunding project, and determine how to improve your results. We consider a product “good,” if it converts. That is, when people see the product, do they buy? If visitors go to the crowdfunding product page, a high percentage of these visitors should pledge or contribute. On the other hand, we consider a product “bad” when it does not convert well, or not at all. In this scenario, even after many visitors go to the crowdfunding product page, there are few to no buyers. There’s little to no demand for the product, so few people put in their money. The marketing is deemed “good” if it meets two elements: First, the marketing must drive A LOT of traffic to the crowdfunding product page. Second, the marketing must drive TARGETED traffic to the product page. In order to more easily visualize the types of crowdfunding campaigns that exist, we decided to use a metaphor. Let me briefly go over the criteria and reasoning behind each. When your Kickstarter or IndieGoGo Campaign (“crowdfunding campaign”) combines a bad product with bad marketing, outer darkness is what you get. These are the sorts of ideas, inventions or crowdfunding campaigns that are not even backed by your friends, family, or fools (FFF)! You want to avoid this quadrant at at all costs. Some examples of campaigns that fall into this quadrant include: Paws of Nepal (while the idea had noble intentions, it is impossibly difficult to market and the product is very unclear. Many would-be backers simply did not understand why they should care about rabid dogs being “put down” as these dogs appear to be attacking citizens and policeman), Drink a Red Bull in Every State (not only did this project raise only $1 USD, indicating the product was bad, the marketing was also pitiful. The bit.ly link to share the campaign has only one click on it, to date! Of all of the quadrants in our Crowdfunding Success Matrix, Outer Darkness is the most self explanatory and most easily understood. In summary, for crowdfunding campaigns that are Outer Darkness, no amount of marketing or ad spend will matter. It is best to cancel your crowdfunding campaign, if you find yourself in such a position; or, better yet, simply learn how to NOT create an Outer Darkness campaign in the first place. In reality, although we classify this as the second worst quadrant to fall under, a Black Hole might very well be the worst of all quadrants. A Black Hole crowdfunding campaign indicates good marketing but a bad product. When you combine good marketing with a bad product, your ROI is going to suffer. You’re essentially throwing your money away, as if into a black hole. No amount of marketing will ever produce the sorts of returns necessary to justify turning your crowdfunding campaign into an actual business. And, generally, your crowdfunding campaign will not get funded either. For instance, while the idea was originally created because the Creator was getting headaches will working at a desk job, in the video and the story for the campaign, Orka was pitched as a way for athletes and active people to remember to be hydrated. Now, I don’t know about you, but, when I’m running or playing a sport, when I’m thirsty, I simply drink! I do not have to be reminded through an app on my phone to do so. Had the story remained true to why the product was originally hatched, perhaps the marketing would not have been for nothing. On this product, timing was also a problem. Orka launched following in the footsteps of the most successful crowdfunded “Smart Water Bottle” of all-time, HidrateMe. By not allowing enough time to pass between the end of HidrateMe’s Kickstarter campaign and Orka’s launch, backers likely were not quite ready to back another product so similar. This made Orka a bad product and no amount of good marketing could lead to good conversions. Ultimately, this campaign was cancelled by the creator. Of all the four quadrants, at Funded Today, this one is actually our favorite. A shooting star crowdfunding campaign starts off with a good product but the marketing simply does not last. It is fleeting, just like a shooting star. Therefore, we classify this type of case as having bad marketing but a good product. We like these sorts of crowdfunding campaigns because when it comes to marketing, we are the best in the world. If you have a good product, there’s an extremely good chance that we can run very successful marketing for you. Examples of Shooting Star projects include the following campaigns. Magbelt You’ll notice from the screenshot below that Magbelt had a mild “Spike” at the first of their campaign, followed by very minimal pledges for the next 7-10 days. However, you’ll also notice that picking up on roughly 7-2-2015, another HUGE “Spike” transpired. Why caused that spike? That’s when Funded Today turned on it’s marketing. Magbelt is a great product. They utilized their own network and generated some moderate success before trailing off/fading (just like a shooting star). However, because Magbelt is a good product, when they hired Funded Today, and applied good marketing, they had astronomical results and their pledges skyrocketed! See what I just did there. Another example from quite some time ago is our Client, FreeWavz. Freewavz had a goal of $300,000 USD and they had “only” reached about $180,000 when they hired Funded Today. However, there was hardly any time left on their campaign. And, as you might know, Kickstarter is all or nothing funding. No one is charged until a project meets its funding goal and the funding period ends. So, in FreeWavz’s case, the roughly $180,000 USD they had already raised was in jeopardy of not being collected should they not meet their $300,000 USD Kickstarter goal. With less than 5 days left on their campaign, we took the risk and accepted the challenge. As you can see, they had sporadic marketing throughout their campaign. Their product was good and therefore they were generating pledges, they just didn’t have consistency. Their project is the case of many shooting stars, each more fleeting than the last. On 8/03/2014, Freewavz hired Funded Today (we’d also spent the previous 2-3 days testing things out, in full disclosure) and you can see the remarkable “Funded Today Spike” on their campaign. You’ll also notice that this spike was consistent throughout the duration of their campaign. In just a few short days, we got them past their $300K goal and helped them raise $325,000! 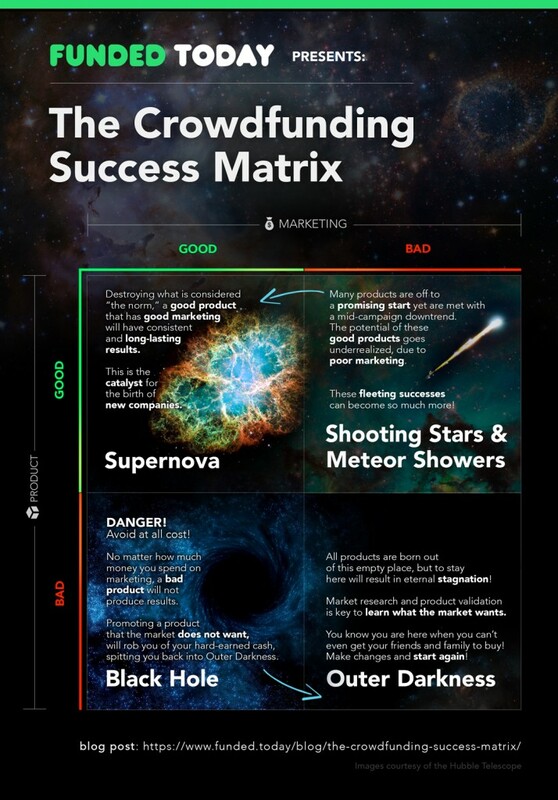 Of the four quadrants, shooting star crowdfunding campaigns have the power to change. And, that’s what makes them so exciting. By simply tweaking the bad marketing on a good product, we can achieve what many see as “miraculous” results. Time after time, example after example, crowdfunding campaigns that are good products but have bad marketing benefit when the marketing is simply fixed. At Funded Today, 80% or more of our success stories fall into the “Shooting Star” quadrant. We take good products and employ good marketing and raise millions. If you’re crowdfunding campaign is live and believe you fit in this quadrant, hiring Funded Today is easy and you’ll qualify for our pay-later, percentage-based funding. Simply apply here to get started and one of our Client Specialists will be in touch with you within 48 hours maximum. A good product combined with good marketing, gives you a supernova. This is exactly where you want to be if you hope to raise millions on Kickstarter. Some of Funded Today’s past Clients who fit into this criteria are:Baubax Travel Jacket (we helped them raise over $4.4 Million USD), Pugz ($1.43 Million USD raised), and Meater ($1.25 Million USD raised), among many more of our Clients, all fit into this quadrant. 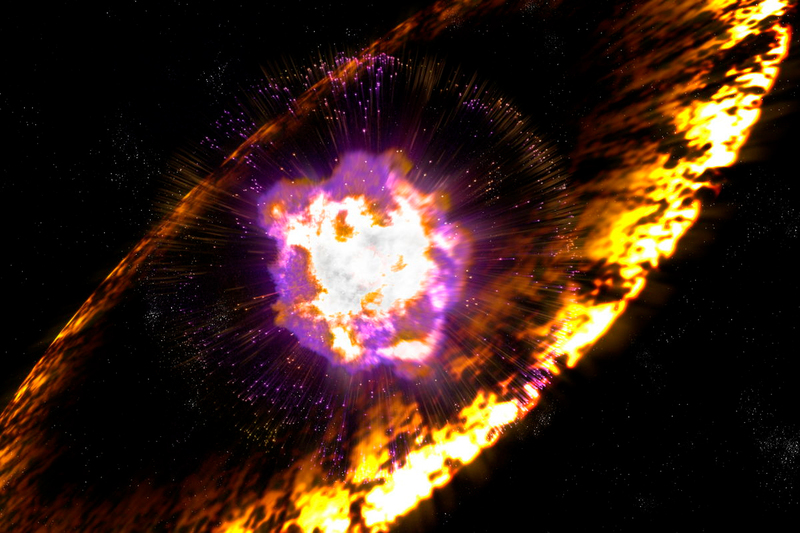 In short, a supernova is an explosion of a star that briefly outshines an entire galaxy radiating as much energy as the sun or any ordinary star is expected to emit over its entire life span. Normally, this “shining” and energy radiation lasts several weeks or maybe even many months! That’s exactly what you want to do during your 30-60 day crowdfunding campaign. Compare the daily pledges in the Baubax Travel Jacket chart below to the shooting star charts above. You’ll notice that for the most part, there were NEVER any peaks and valleys/troughs. The pledges came in consistently throughout. The spikes came from landing press throughout the campaign and by increasing paid media spend as the ROI and time remaining on the campaign afforded. For Baubax, you’ll notice that the “Really Big Spike” at the end of the campaign was a combination of Funded Today ramping up our 3-Tiered Marketing Approach (watch our Video here to learn more about that approach) along with some last minute press that was landed on the campaign. Very simply, we have the most success with Shooting Stars and Supernovas. 99% of the time, these sorts of crowdfunding campaigns meet all of our marketing success criteria and qualify for our pay later percentage-based funding. On the other hand, Black Holes and Outer Darkness campaigns never meet our criteria and therefore must always pay an upfront fee to utilize our services. 85-90% of the time, by simply using our Crowdfunding Success Matrix, we can determine what crowdfunding campaigns will succeed and which will fail. In summary, please take our Matrix and apply it to your own crowdfunding ideas and campaigns. Strive to create great products. We’ll continue to write more articles about how to create great products so be sure to subscribe to our blog for more helpful tips and tricks. And, of course, Funded Today is the best marketing agency in the world so once you have a great product, we’ve got your marketing covered!